The image above is an evocative glimpse into the past of a place which today most Sydneysiders associate with bustling activity and crowds – Darlinghurst. Yet Darlinghurst, which sits between Woolloomooloo, Kings Cross and Surry Hills, was once a place bustling with a very different type of activity. Before European colonisation, Darlinghurst was part of the traditional lands of the Gadigal people and even after colonisation, these people continued to extensively use the land right through to the 1840s. Although Darlinghurst was very close to the early settlement areas of Sydney, it was actually not settled until comparatively late. Darlinghurst was a place of shallow soils and rocky sandstone outcrops which made it less attractive to early European settlers as a home, but it was not entirely ignored. The rocky outcrops were extensively quarried for sandstone to use in construction of many of the early Sydney buildings. The early quarriers were convict gangs, while in the second half of the 19th century prisoners from Darlinghurst Gaol (now the National Art School) were put to work. Quarrying wasn’t the only activity to take place in Darlinghurst though, with the first water mill in the colony built there in 1811 and the four windmills featured so extensively in early paintings of Sydney appeared soon after. Darlinghurst may have begun its European life with the lower eschalons of Sydney society, but in the 1820s the area began to be transformed. Governor Darling named the area in the late 1820s (quite probably after his wife, Eliza Darling) and between 1828 and 1831 he made 17 grants of land in the newly named area. These were all made to wealthy colonists and there was a stipulation that all houses had to be worth 1000 pounds or more, and had to be set in landscaped gardens. Governor Darling even had to approve the design before construction could begin! As a result, Darlinghurst not only became associated with the wealthy, but also had a landscape of fine houses and gardens overlooking the town which Governor Darling imagined as an example to the more ‘debased populace of Sydney Town’. By the mid 1880s though, many smaller terrace houses had been added to Darlinghurst and eventually Darlinghurst was transformed from a strictly wealthy suburb to a suburb which contained areas which many considered to be slums. There was a wide mix of classes and indeed reputations, with the respectable residents living alongside criminals and gangs. It wasn’t until the 1920s that Darlinghurst really began to become a more sinister place though, with gangs and criminal elements beginning to become prominent. Today, Darlinghurst has returned much more to its early 20th century reputation though, with a mix of wealthy, often family residences alongside the many pubs and brothels. 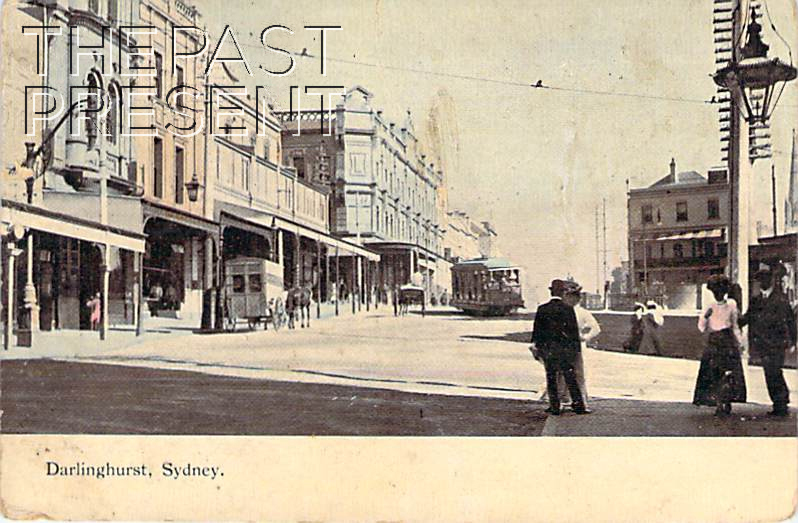 This entry was posted in New South Wales, Sydney, Sydney Suburbs and tagged 1900s, buildings, postcard collection, streets, sydney.